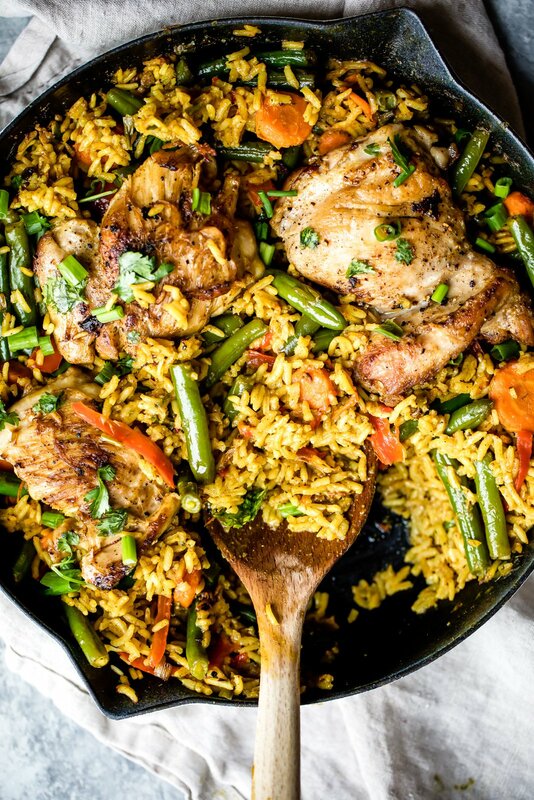 Incredibly flavorful yellow curry chicken and rice made in one pot with plenty of veggies and delicious flavors from coconut milk, ginger, garlic and turmeric. Great for meal prep! Hello, hello! I hope you’re reading this with a smile on your face, a cup of coffee or tea in your cup and of course that you had a relaxing, rejuvenating weekend. Did you do anything fun? We spent Friday night dining out at my favorite sushi place in the world and sipping wine. I was craving the roll called the black mafia — if you’re ever craving sushi in Chicago, this place is where it’s at! Saturday went by quick too — we met our wedding photographers and scoped out beautiful spots around the city to take wedding photos (we’re less than two weeks away). And on Sunday, I relaxed on the couch, made a puerto rican chicken stew with tostones and caught up on several episodes of Stranger Things. Today isn’t about stew though, but rather this fabulous coconut yellow curry chicken and rice with LOTS of crunch veggies and flavor from garlic, coconut milk, turmeric and ginger. I’m in loveeee. I have to have some sort of Thai inspired meal at least once a week. And so what better than to make a recipe you can easily meal prep for the entire week, then put in containers for lunch. It’s healthy, packed with protein and SO MUCH FLAVOR! What I love about this recipe is that it’s incredibly forgiving and made with some of my favorites pantry staples. 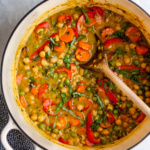 You can make it with any veggies you’d like though: snap peas, broccoli, sweet peas, asparagus, orange or yellow bell pepper — this list goes on and on. You can easily meal prep this recipe with the instructions below in the recipe. However you do it, I hope you love it! 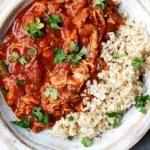 If you make this curry chicken and rice, be sure to leave a comment below and rate the recipe! You can also snap and picture and post it on Instagram using the hashtag #ambitiouskitchen. xo! 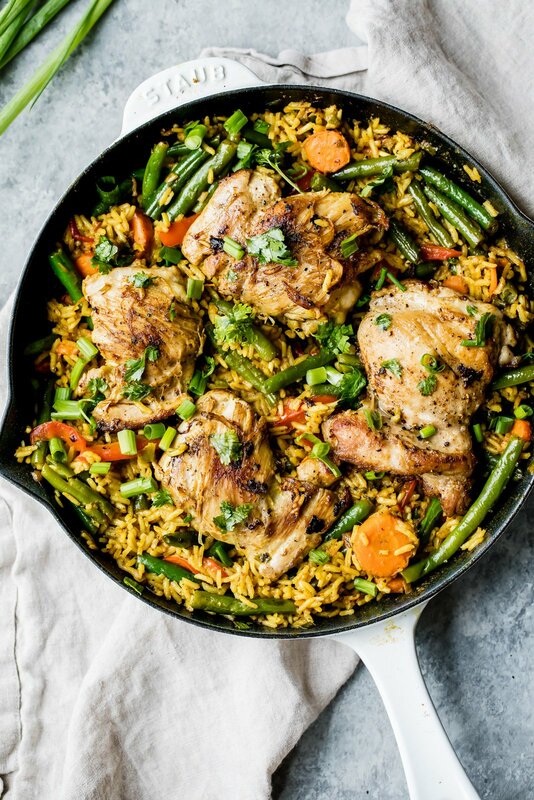 Incredibly flavorful yellow curry chicken and rice made in one pot with plenty of veggies and delicious flavors from coconut milk, ginger, garlic and turmeric! Great for meal prep! Place a large deep 10 inch skillet over medium high heat. (If you do not have a skillet a large pot will also work very well!) Add in coconut oil and garlic. Once hot, add in chicken and season generously with freshly ground salt and pepper. Cook until browned 4-5 minutes, then flip and and cook an additional 4-5 minutes. Remove from pan and transfer to a plate. In the same skillet (it should be greased enough already for sauteing), add garlic, ginger, chopped green onion, red bell pepper, green beans and carrots. Saute over medium heat for 3-4 minutes to absorb pan flavors. Next add in coconut milk, yellow curry powder, turmeric, lime juice and salt; stir well to combine. Bring to a simmer, then fold in the rice, making sure it is evenly distributed. Add browned chicken on top. Reduce heat to low, cover the skillet immediately and cook for 20 minutes. After 20 minutes, most of the liquid should be absorbed and rice should be cooked. Serve immediately. Garnish with cilantro and green onion. This meal serves four. 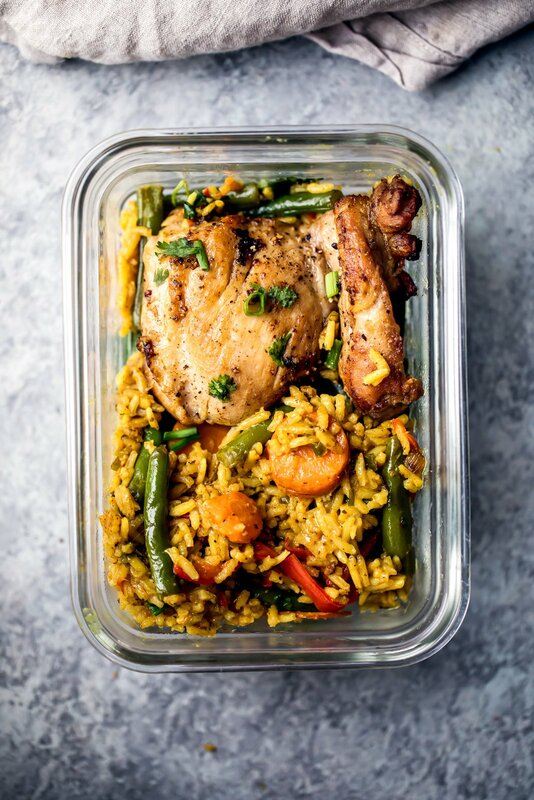 Place rice in a meal prep containers and top with 1 chicken thigh. Garnish with cilantro and green onions. Do not use brown rice. It takes a lot longer to cook and I would NOT recommend… SERIOUSLY DO NOT TRY IT. If you are looking for an alternative, I would recommend subbing 3/4 cup quinoa. The cooking time will stay the same. 133 Responses to "One Pan Thai Coconut Yellow Curry Chicken & Rice + Video"
Yum! Yellow rice is my jam 🙂 Everyone is talking about Stranger Things. I need to jump back on board! Could you use green curry paste instead of yellow? absolutely! That would be fabulous! Thank you so much!!! I’m so happy you and your little one enjoyed it. 🙂 dinner winner! This looks amazing. I’m excited to try it! If I make this with quinoa, should I still use 1 cup? Thanks! I love a good Thai curry. Can’t wait to make this for lunch next week. Looks great! But …. other than doubling the time (from 20 minutes to 40), why do you recommend NOT using brown rice? Seems to me that if you have the patience, it’s worth it to have the whole grain. I’ve made similar simmering rice dishes with brown rice, so I’m wondering why this one wouldn’t work. It didn’t cook evenly when I used brown rice and the chicken got dried out a bit, but you could try it and let me know if it works for you. Brown rice takes forever! Which is why I prefer basmati 🙂 I’m glad you enjoyed this anyway! I used instant brown rice and cooked it mostly before adding it, and it was fabulous!! Thank you! I moved far away from my favorite indian restaurant (10 hours), and this is the first time I attempted it. Not sure if someone else mentioned this but wondering if making this with bone-in thighs would work better for brown rice because both need a longer cook time…. I haven’t tried it, so I’m not 100% sure. The brown rice does take significantly longer though so I wouldn’t recommend it! This looks amazing! Do you add the rice uncooked or cook it (so that it’s nice and fluffy) and then add it? Can’t wait to make this! On the ingredient list the rice says, white and fluffy, which made me think you meant cooked. Apologies for any confusion! I’ve added a bit more detail to help. Did you by chance take off the print option on your recipes? I wanted to print one and I don’t see it anymore. Thanks!! Love all your recipes!! Hi Erica! Currently working on a small glitch – apologies for any inconvenience. Glad you enjoy these! This is the first time I’ve made a coconut curry and omg I’m hooked! My grocery store didnt have yellow curry, so I used green and it was a delish substitution. I also subbed broccoli for green beans (bc I hate green beans and I had broccoli already), which was also a great substitution! I will definitely be adding this to my recipe rotation. OH! and another substitution – I had cauliflower rice, so I used that as well instead of basmati. Amazing flavors! I’m on a roll today with your recipes! Now on to figuring out what to make next for meal prep…! I was thinking of using cauliflower rice also, but wasn’t sure it would work. I figured rice would soak up some of the liquid, but not so with the cauliflower. Good to know you had good results. Thanks. Monique, This was the first dish I have tried from your site. I was blown away at how delish it is. I was also surprised that only one serving was enough to fill me up. Being six foot and 210 guy. It is sometimes hard to feel me up on a healthy diet. Thank you for this recipe I’m looking forward to your Tomato Basil soup next. Just made this dish. In addition to the vegetables you suggested, I added three mushrooms as well. I had no green onions on hand so used one leek instead. I also used 1 tablespoon of yellow curry paste rather then the two you suggested in your recipe. Delicious! This is great for adding almost any vegetables you like 🙂 Glad you enjoyed! Hi! 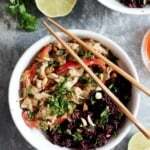 This recipe looks fabulous but since we he a coconut allergy in our house, what would be a good substitute for the coconut milk? I have been making your recipes since 2012 but this one is by far my favorite! My husband and I really enjoyed it for our dinner this evening and I’m looking forward to eating leftovers to end the week. Keep up the hard work- Its been amazing watching you evolve and succeed over the years! You’re an Ambitious Kitchen lifer! This makes me so happy 🙂 I’m glad you guys loved this one, too! Thai food actually So Gorgeous and delicious when I last time visits I teste much food in many restaurants. I didn’t forget their soup. but after the read of this Recipe, I think Now time to make a Thai soup in my kitchen. Thank you Monique! OMG this was amazing and super easy to make as long as instructions were followed. The only part that confused me a little bit was the description of the rice in the ingredients – I thought it meant add it already cooked (“nice and fluffy”), however luckily at the end I saw that the liquid should be absorbed and the rice should be cooked after the 20 minutes…. Thank you so much for this recipe! I’m so glad you enjoyed! Noted on the ingredients list here (I describe basmati and nice and fluffy as it creates that texture 🙂 ). But yes, rice cooks up in the liquid! Hi Tania! We’re currently working on a fix for this – apologies for any inconvenience. Amazing! I’m so glad you enjoyed it. Delicious meals all week! I’m a bit confused on the recipe. Garlic is mentioned twice in the ingredients, and twice in the instructions. Is garlic cooked with the chicken, and then more added with the veggies? Also, green beans are mentioned twice in the ingredients. Thanks! I’m going to give it a try. Hi Carole! You’re correct – 2 cloves of garlic are cooked with the chicken, and then 2 more cloves are cooked with the veggies. I didn’t catch the second time green beans are mentioned (you may have read “green onions” as green beans!) The video helps to clear any of this up, too 🙂 Enjoy! I made this for dinner tonight- so delicious! I have been following your recipes/blog for over a year now- everything is awesome! Made this tonight! A little spicy for me but my husband was in heaven. Would this work if I made the rice separately and just let the sauce and chicken simmer for the 20 minutes? Then I can control the spice level a bit so I have less sauce and my husband can load up on it. I love the flavors though. I have made other Thai curry recipes that were not as flavorful. Spot on! Cooking the rice in the sauce actually allows the liquid to be absorbed (so that it doesn’t end up being soupy), but you could just heat the chicken & veggies in the sauce and scoop it over your cooked rice portion. Just know that the sauce may not absorb that much. Also, you could try using a yellow curry that’s less spicy! Made this dish last night and it turned out great. I would not change a thing in this recipe. My family normally rank the meal from a scale between 1 and 10 with my daughter being most conservative in her assessment. This time she ranked it as a 9.5 which is the highest she has ever ranked anything! Needless-to-say this recipe is a keeper. Thank you so much for sharing this with us! Thank you Steve! So happy your daughter enjoyed it!! I have another yummy dish coming soon that’s made in one pan that I bet she would love. Stay tuned! So so delicious! My husband – who swears he doesn’t like curry (eye roll) – is currently eating seconds. This is going to be in our regular rotation. Had to hop on here to leave a rave review! My family members and I absolutely loved it! I added a cube of chicken bouillon to the coconut milk before adding the rice and subbed chopped carrots for the peas. 10/10 amazing, restaurant quality. Will definitely be making this one again! I’m so glad you and the whole family loved this one! It’s one of my favorite one-pan meals for the week 🙂 Enjoy! Confirmed: do not use brown rice. Also, always read the whole recipe before shopping. Yes! Sorry if you had some trouble with any of your substitutions! Please please please start frying your spices in the oil FIRST. Every time I watch a video of someone adding the spices late I cringe. I love your recipes but this is so essential! I do typically cook the fresh spices in oil first! Made this last night instead of watching the superbowl and I have no regrets! So delicious and now I have meals to eat for the week! Sounds like a great choice to me! I’m happy you loved this one – perfect for meal-prepping. So when do you add the garlic? Or is it a divided amount? The instructions have it being added twice: once before the chicken, and again after the chicken’s removed. Just made this tonight – amazing!!! Such good flavor and so easy to throw together. So happy to hear that!! This is one of my go-to’s for weeknight dinner. I used 7 chicken thighs, because 4 didn’t seem like enough with all of the other ingredients. It will definitely be enough for 6 or 7 servings, it made a big pan of food! Yes this makes quite a bit! Hope you enjoyed it! It was obvious (to anyone that cooks) that there was not enough liquid in this recipe to fully cook the rice. Decided to try it anyway since it got so many positive comments and yep – rice didn’t get cooked. Tried adding more liquid towards the end. Came out OK. Very disappointing. Hi Ellen! According to the directions of a standard basmati rice package – it requires 1 1/2 cups of liquid. In this recipe there’s 1 3/4 cup of liquid from the coconut milk. I’ve never had trouble with the rice fully cooking, and haven’t heard of any trouble from others. It turned out perfect just as written. It was a perfect consistency and the flavors simply divine. I am thinking of serving it with cauliflower rice instead of basmati. Do you suggest adding less liquid? Thanks! I would probably use a bit less liquid – I’m not sure how much the cauliflower rice will absorb the liquid, so just know that the consistency will be different than quinoa or basmati! I have made this recipe successfully (deliciously!) several times with a can of lite coconut milk as written in the recipe. (Did not understand an above comment about not having enough liquid for the rice.) Currently, I only have full-fat on hand. Could I still use it? Would I need to add a bit more liquid since full-fat seems to be not as “liquid-y” as lite? Anyone tried it? I only ever have full fat coconut cream and milk on hand and have made this twice with ff. Once using brown rice (yup takes longer) and once rice seperate. It was delicious both times. It should still work but you can always add some liquid if you’d like! Hi Monique. I love this recipe and have made it twice already. I’m just wondering if you think there would be a way I could do it in the slow cooker at all please? Hi Kylie! I haven’t tried making this in the slow cooker, so I’m not 100% sure about the timing. Let me know if you give it a shot! Love this recipe but my rice was a little undercooked because I could only find a 13.5oz can of coconut milk. What can I add to make up the difference? Water or chicken stock? Do you have any other one pot recipes that you would recommend for meal prep? Hey Erika! You can add water or chicken stock for some extra liquid. Some other one pot recipes you might like are this Tandoori Chicken, this Moroccan Chickpea Quinoa Salad, and some more in this round up of meal-prep dinner! I tried this last week. I was very nervous as I have a 6 year old and a 3 year old. For some reason, it came out spicier than I was expecting…maybe because I toasted the curry powder a bit? and my 6 year old will not touch spicy food for some reason. At any rate, I just dropped a dollop of plain greek yogurt on it and no one said a word about it being spicy! My 6 year old’s exact words were “this is glorious.” I will be making it again tonight. Hi Monique, I made this last night for dinner and used whole coconut milk instead of lite, with added chicken stock to equal 15 oz, and we ended up having to add water and cook longer to get the rice to cook fully. Do you think it is because I used whole coconut milk instead of lite? Curious because I prefer whole. Thanks for the recipe! It still turned out yummy although diluted. Hi Victoria! It could’ve been due to the thickness of the coconut milk, so I would recommend adding some more coconut milk or chicken stock next time. I was just wondering if I wanted to one and a half the recipe would I one and a half the coconut milk? Has anyone tried making a larger quantity dish? Also wondering how spicy it is as we like heat (if I should add extra spice). 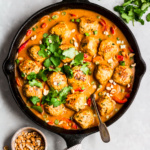 I was thinking of making this with tofu instead, would you recommend baking the tofu and then adding it in at the end? Thanks so much it looks so delicious! Hi Meagan! Yes I would one and a half the coconut milk. The spice depends on the curry powder you use, so if you like spice I would opt for one with some heat! And then for the tofu – baking it and adding it at the end should be fine, you might just want to reduce the liquid a bit. would you be able to use jasmine rice instead of basmati? This was delightful! I am thrilled to have this recipe. This will be a regular addition to our menu plan (will also try it with shrimp, other veggies etcfor variety). The flavor was heavenly! Thank you so much! I am excited to have more tomorrow at lunch! So happy you found this recipe, Kate! It’s perfect for customizing with different veggies + proteins too 🙂 Enjoy! Hi! 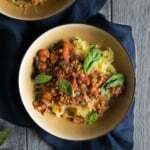 Can I substitute the fresh grated ginger with ground ginger? Hi! Yes – I’d recommend just a teaspoon of ground. WOW, this dish is incredible, we had our canteen chef make it for lunch, was a sell out in half an hour. Many thanks for the inspirational lunch recipes. Hi, if I were to make this as meal prep, can you reheat it the next day or is it best to eat cold? Thanks. You can definitely reheat it the next day 🙂 Enjoy! hubby is mr picky and he loves this!!! 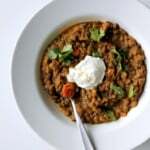 he’s also Indian with an amazing indian cook as a mom and approves of this recipe!! its a staple in our house. YAY FOR ONE SKILLET DISHES!!!!! This recipe is AMAZING and is on regular rotation. However, I have a need to make it vegetarian. What do you recommend for a meat substitution? I figured tofu, but should I still fry it up in the coconut oil? So glad you like it! Tofu or even chickpeas would be delicious in here. Enjoy! I just made this as dinner prep and ate one of the portions- SO GOOD!!! I subbed quinoa for white rice and had to add a little water to the pan after taking the chicken out, it didn’t leave enough grease behind. Those are my notes, and I’m extremely satisfied with how this came out! It was delicious and I will DEFINITELY be making it again. Thank you!! Perfect! So glad you loved this one, Sarah! Hmm this didn’t turn out great for me because the rice turned out undercooked. Not sure why, as it seems everyone else had success. Is there anyway to re-cook/re-heat so the rice cooks fully? That seems odd— what kind of pan did you use?! Perhaps your heat was too low? Any suggestions on how to use calliflower rice in the recipe instead of rice? Hi Sarah! People have swapped in cauliflower rice and followed the recipe as-is. That should work well! So happy to hear that, Jennifer! This is one of my absolute favorite dinners. Glad you loved it too! This dish is excellent. Very flavorful and easy to make. I made this for meal prep this week (my second time making it) & I just got a text from my third-shift working husband who said it’s “so good” he ate it for breakfast today because he was craving it. Haha! I’m thinking I’ll have to double the recipe to have dinner for the whole week next time. Amazing!! So glad you guys loved it. It makes the best leftovers! 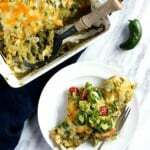 I love this recipe it give my chicken rotation a nice flare. I am going to make the rice and topping with grilled shrimp. Perfect! Sounds like a great dinner. Hi! I just wanted to let you know I made this last night and it was EXCELLENT. So easy to prepare, and it came out delish! I just subbed full fat coconut milk in for the low fat and it was delish! Perfect!! Glad you loved it, and thanks so much for rating!